Singapore Watch» Blog Archive » Property prices, how much lower can it get? « Are Housing Prices still too high? Property prices, how much lower can it get? Market Uncle talks about housing prices in Singapore and even cross references some charts! I compile 4 graphs into one above, trying my best to align them in the same time line I could. The graphs are, from top down, Singapore GDP and growth, STI index, HDB resale price index and private property price index. 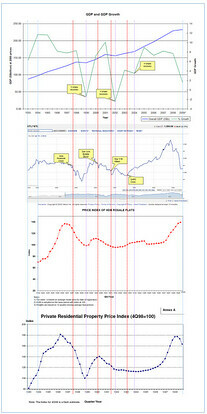 Indicated on the graphs are 4 red lines, each indicating the 4 significant events affecting Singapore’s economy, namely Asia Financial Crisis, Dot Com bubble burst, September 11th terrorist attack in the US and SARS crisis. 1. Property prices (both private & HDB) are much higher now than during each of the 4 crisis. 2. GDP growth is badly hit during each of the 4 crisis and Singapore entered into recession (-ve growth) during 2 of the them, Asia financial crisis and SARS. 3. V-shaped GDP growth recovery seems to mark the bottom of the property prices, around beginning of 1999 and during the period from 1Q02 to 1Q05. 4. No conclusion to be drawn for relationship between property prices peak and GDP growth. Check out the rest of the entry here. This entry was posted on Tuesday, February 24th, 2009 at 2:36 pm and is filed under Singapore Watch ver 2.0. You can follow any responses to this entry through the RSS 2.0 feed. You can leave a response, or trackback from your own site.